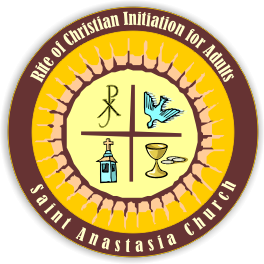 Are you looking to complete your initiation into the Catholic Church? Weekly gatherings are for those in the initial stages of learning about the Catholic Faith and/or those who are thinking about joining the Church. The format is informal and is based on questions that arise each week. Friends and spouses are always welcome. The Catechumenate (cata-cume-men-et) consists of weekly gatherings for those who have made the decision to join the Catholic faith, or for those who been baptized Catholic and wish to complete their initiation through sacraments Eucharist and/or Confirmation. During the Catechumenate, we attend Sunday Mass and meet on a weekly basis. Unbaptized candidates may spend 1-2 years in the in the Catechumenate group. The length of time in the Catechumenate group for baptized candidates depends on the amount of Adult faith formation they have had on their journey thus far. Each candidate will journey towards full initiation in the Catholic Faith. The mystagogia (mista-go-gia) gatherings are for those who have recently joined the Catholic faith or have completed their initiation. These gatherings offer newly initiated Catholics an opportunity to share and celebrate their new life in the Church.